Definitely the hardest thing I've ever done in my life physically. Running injured is always tough, and 40 miles a day isn't the best "rest cure"! I wish I could have run more consistently. It was not to be - but finishing was an achievement given the state of my shins and ankles for the middle 10 days of the race. 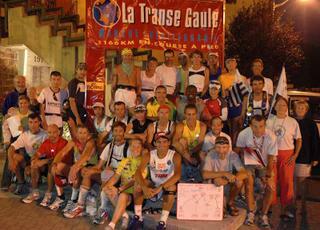 Jean-Benoit (race director) and all the volunteers were simply fantastic - impossible without them. 18 days of superb organization and support. There was tremendous spirit between the competitors. Everyone was pulling for everyone else. 24 starters, 24 finishers - a unique occurence in ultrarunning? I miss my fellow sufferers, now we've gone our separate ways in life. And finally, thanks to everyone - family, co-workers, friends - for the great support. I couldn't have completed without the positive thoughts coming at me from afar. An unforgettable experience. Hey, congratulations. Great posts and great work on the race. What an impressive accomplishment! Hope to meet you at a race some day. What will you do next? Congratulations, Russ. Now take care of those feet. Next time choose a route through Switzerland? Day 18 - Final Day!